Flora Gomes. Photo by Cineport Festival. Flora Gomes studied cinema in Cuba. Studied with Paulin S. Vieyra cinematographyn Senegal. Then became a reporter for the ministry of Information in Guinea-Bissau. After which worked one year as an assistant for the french director Chris Marker, whose black and white science fiction short La Jetée was the inspiration for Terry Gilliam's Twelve Monkeys. Completed a number of shorts. Has filmed in Cabo Verde, Portugal, France, and Guinea-Bissau. Makes a point of residing in his native Guinea-Bissau where filmmaking is only for the mad. Gomes was 38 years old when he made his first feature film Mortu Nega. National liberation struggle, modernization, conceptualization of identity, sophicasted african feminism, environmental degradation, symbolic, aesthetically innovative, historically significant. - in 2 first films there is doubt, the 3rd film made after the greatest horrors in contrast has no doubt, there is a clear positive message. Gomes explores similar themes in different contexts. Rebirth. The rights of the youth. The power of the young ones. The elderly need to accept the change they were fighting for is not the change the children wanted. Flora Gomes traz idéias abstratas para a tela. É a ultima hora do filme. Uma festa. Todo mundo ja foi dormir, e esta amanhecer. O Vicente ainda esta desperto, incapaz de dormir – preocupado. Ouvimos as crianças correndo. Eles estão embaixo de uma mesa. Empurrando-o. E abaixo essa mesa, caem todos na piscina. É a escena que simboliza o país. Guiné-Bissau está entre os 5 países mais pobres do mundo. Flora Gomes faz uma declaração significante, criando seus filmes lá. É uma sociedade comercial vibrante. Televisão, compras, moda, boates – tudo. Mas tambem com ideais quebradas. A geração revolucionária pergunta se este É – "o país é que nós queríamos. Por qual lutamos." Os idealistas nao encontram amor. Nem veem-o. O Vicente, enquando o amor esta a despertar-lhe, ele atravessa a rua. As oportunidades da vida sao perdidas. Mas as crianças, aunque caídos na piscina ha pouco, continuam a dançar. Calhar que saibem melhor que os adultos. Nha Fala is a film about Vita. A girl whose family has been cursed to never sing. Upon going to study to France, she falls in love with a french music producer And eventually makes a disk. Of independcence and social justice. This statement speaks what Flora Gomes is all about. "Whenever Africa is spoken about or depicted, it is always in terms of the aid we receive, war, people dying of starvation, sick people"
". . . These things do of course exist in Africa: Africans kill other Africans, and nobody knows why we go to war, yet it still goes on." "I wanted people to see our Africa, the Africa of my dreams, the Africa that I love and that I would like my children to know one day. It is a happy Africa, where people dance, where people can speak freely. It is my take on the future for a new generation.—Flora Gomes"
"But there is another side to Africa, and that is what I wanted to show. It is a side you never see on your television screens in the West. That is why I made this film." I first saw it at the Fitas na Rua in Lisbon, a brilliant series of cinema events that every Saturday and Sunday in August makes one public place in the city (garden, square, park, whatever) a cinema theater. I though it was a fantastic film and it was made by a director I had never heard of. Flora Gomes. The film was by Flora Gomes, called Udju Azul Di Yonta and it became one of the influences for my documentary. Before making Tomé, I was looking for Lusoafrican films to get into the mood; As African cinemas go, Guinea-Bissau is not well researched and there’s not that much about written about its history in film. So it seemed interesting. According to IMDB 9 films were made in Guinea-Bissau out of which I've seen 5. Flora Gomes. Gomes hails from Guinea-Bissau but lives in Europe (Lisbon and Paris) and is the country's most influential (and perhaps the only active) film director. 1992 - Udju Azul di Yonta (aka Les yeux bleu de Yonta, Os olhos Azuis de Yonta, The Blue Eyes of Yonta). Viewable on African Film Library and MUBI. (Seen.) 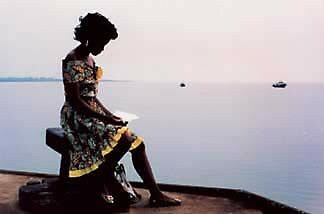 Synopsis: The daily life of a series of characters in a country, Guinea Bissau, rebuilding after long years of war. The focus is mainly on the beautiful and irreverent Yonta, a girl of the new generation. Woyingi gives a good overview of Flora Gomes' early years, and the influences of Ousmane Sembene, Santiago Álvarez, Paulin Soumanou Vieyra, and Chris Marker on the development of his career as a film director. Nwachukwu Frank Ukadike interviews Gomes in his excellent book Questioning African Cinema: Conversations With Filmmakers. Film Birth is a fascinating site with stories about the birth of film in many countries, including Angola, Mozambique, as well as Guinea-Bissau. There’s no entry for Sao Tomé and Principe though. Before watching the films - or after; it's really up to you whether you prefer to form your own analysis without someone else's thoughts to confuse you in advance -, but here's a good introductory essay about filmmaking in Africa by Josef Gugler: African Film: Re-Imagining a Continent; and also the full book. I was recently treated to an unexpected private screening of Flora Gomes’ new feature The Children’s Republic, in original language “República di Mininus” (2012). For some unknown reason the event was not well publicized and I was the only person in the cinema. The film, produced by Filmes do Tejo, talks about a country run by kids and is brought to life by Danny Glover as lead and a cast of new-comers. My first impression was that the film's metaphorical writing felt thoughtful abd entertaining while the acting was admittedly rough around the edges, varying unevenly. Sound and Youssou N’Dour’s music could be integrated better to the emotion on screen. With a sometimes TV-like cinematography and weird grayness-blueness of the image (projection problem?) the film does not recall the crispness and color of previous Gomes’ work but on the other hand smooth steadycam camerawork and editing were spot-on throughout. The decent production values and Glover’s presence make it feel low-budget Hollywoodian production. Danny Glover left the following video message about the movie. The universal themes of salvation and rejuvenation as in Nha Fala and Udju Azul di Yonta continue but with a more modern feel. The insertion of a Child Soldier out of place at peace-time and adults banished from the territory are just new tools in the old story toolbox. The chosen imagery is often more clever though, serving the director’s trademark preocupations well, with Glover diving under the table between the shoes of suited-up officials, as he loses his glasses in another gov-meeting full of 2020 goals, to be handed later in the film almost Google-Glass-like future vision spectackles by a child, who like all children in the film represent their future selves. It’s the first English-language movie from Guinea-Bissau, Even though the british accents sometimes feel out if place, perhaps just my prejudice The film contains enough explosions, drama, but also storytelling with heart and message & Danny Glover in leading role + a touch of Magicalr Realism, makes it a worthwhile experience for more than the Gomes’ core fanbase. I’m leaving the empty cinema hall with the question lingering in my mind can this film find an appreciating mainstream audience? Updated, edited and contensed from notes in March 2015.